Hey book lovers whats up, Its a new day outside so its time for a new book review. 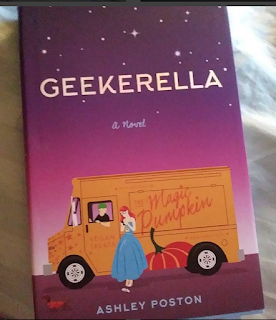 This review is on Ashley Poston book Geekerella which is a retelling of Cinderella for the geek guide girl. It was release on April 4th and I bought my copy from Amazon on April 17th, like I usually do with all my books. I find that Amazon is the cheapest place to go, and I am not sponsor by them, thats just how I feel. So lets get start with the summary about the book. Danielle or Elle is the main female lead, she loses both of her parents at a very young age and her stepmom ends up raising her.Elle’s stepmom is a fake wanna be socialite, just like her Stepsisters. She is a rebel who writes a blog about a beloved Geek Show called Starfleet, Which is much like Babylon five mix with Star trek. In the book there comes about a remake movie of the original show Starfleet very much like we had with Star Trek. So when Elle ends up getting a text message from the wrong number because her dad use to run a comic convention that is now huge and host famous beloved movies. She first tells the person its a wrong number then begins talking to this person. What Elle doesn’t know is that this person is the famous Darien Freeman who will be the lead in the remake movie. Darien is also someone who Elle doesn’t feel like should be playing the lead of the male main character. As the story goes on there is the possibility that Elle and Darien might fall in love? Will Elle finally change her real life and surrounding as well? Will Darien grow up and become more of his own Person? You will just have to read the book to find out, now onto my thoughts about the book. I rated the book a 3 out of five star rating, maybe even a 2.5 more so. Reasons Why? because the story seem to repeat itself. I understood from the beginning how Elle or Danielle was feeling about her life, but it was like her feeling where constantly recycle. To me, it made this great story so incredibly slow. I felt like the buildable to the ending was incredibly long and at times some what boring. Now Darien part of the story seem to have more of a buildable background story, it seem like more was revealed about him then Danielle. But yet Elle was the main female lead with a repeated storyline that we understood from the first half of the book. Darien also reminded me of Chris Pine as Captain Kirk. While Elle could be like Emma from Once Upon a Time, in the way that she wanted to save herself. But yet in the very same moment, she was like Woah is me, in pretty much every part of her story. I did like the Starfleet comic geek-ness of the book, but I didn’t really feel apart of it. I didn’t feel like I was in the middle of the scene or set up of a famous convention base on a beloved show. I am huge fan of Star Trek, Star Wars and Doctor who, so I love it when an Author can make you feel apart of a show as beloved as those. I did love the ending thou, and the beginning was awesome, it was the middle that seem to be a dragged. It slow down for me after the first half of the book and pick up in the last half. 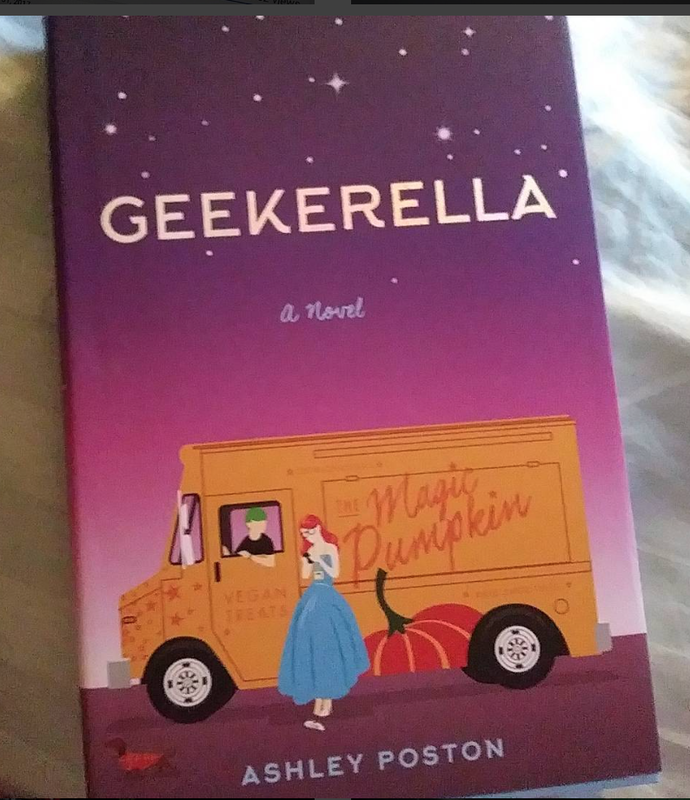 Its nothing like Queens of Geek by Jen Wilde. But it does have a bit of Geeky-ness to it, and it does have a pretty awesome storyline. The middle just seem to dragged and go no where at least on Elle behalf. Otherwise it was overall a great story, the writing was really good. Ashley Poston had a great base for a story. I love that Ashley added in different racial Characters as well which was a great ideal. But the Storyline especially middle half just seem to need a little more work. But don’t take my word for it, you might actually like the book, so I would suggest researching it or buying it. As always the links to the author and book, as well as my social media is listed below.